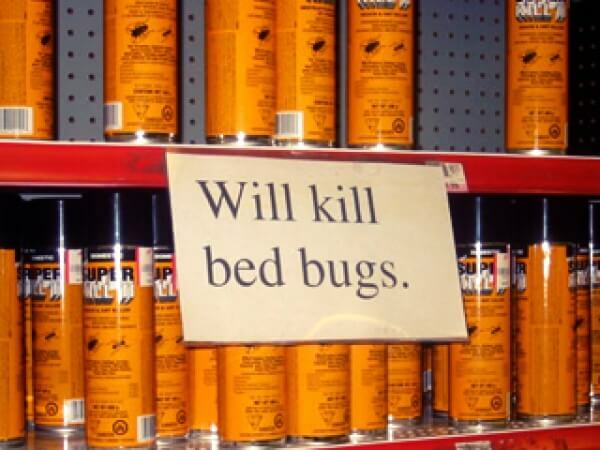 For example see this image below of a Zeller’s in Toronto recently displaying “Super Kill II” which has a plain large font sign saying this “Will kill Bed Bugs“. Now to the average consumer itching from Bed Bug bites this is a very attractive statement, pay only a few bucks, take it home and go crazy on your mattress or problem areas. The problem is that many retailers often make statements they have no way of proving in order to capitalize on emerging trends. Super Kill II may indeed work, but no where on the label does it say it’s intended for bed bugs. So should you use it? In any circumstance when you are applying a pesticide indoors you want to be sure to follow the directions on the label very closely, as this can make the difference between a single application and numerous. Another important feature to look for is that the spray is residual or leaves a residue, water based chemicals will evaporate over time which looses effectiveness. One of the key bonuses of using a product specifically intended for bed bugs is that it has detailed directions on how to target Bed Bugs favourite areas. For example a product like “Better Than” Bed Bug Killer has detailed user instructions regarding the application and specific areas to focus on, such as boxspring plastic corner covers, mattress edges and tufts, along baseboards – the places where Bed bugs hide. They also contain alternate directions for Fleas, Flying insects etc. all with different application methods and key points to be aware of. Killing bed bugs with over the counter products can often aggravate the situation and give people false hope for ridding their homes and business of Bed Bugs. A few decades ago people and pest control companies used DDT to kill bed bugs, it was cheap, extremely effective and unfortunately carcinogenic (Can cause certain types of Cancer). So after DDT was banned from use people began to see Bed Bugs emerge after almost 40 years of being wiped out. So what treatments actually work? The problem with DYI Bed Bug sprays in Canada is that the chemicals are strictly regulated by the Ministry of the Environment, and the few chemicals that are proven effective are so potent they require a Commercial Sprayers License which is only available to professional pest control companies. What this leaves for over the counter products is less potent and diluted chemicals that are mimicking the effects of their more powerful cousins. There is also the controversial “Heat Treatment” which requires an external furnace to be hooked up to your home and then the heat is gradually raised to about 50 degrees Celsius (killing temp for Bed Bugs). With this treatment there is much preparation, as all wax, vinyl and soft materials must be removed or else they will melt. All furniture is pulled away from walls and every bedding and fabric is removed and cleaned before being brought back into the home. This is a costly treatment and should only be used if the infestation is at a mature stage. So in conclusion if you know you have Bed Bugs but don’t have the funds readily available for a professional treatment, go to a local pest control company or online retailer such as www.localpestsupplies.com and buy a DYI product specifically designed for bed bugs, their technicians will also be able to give you expert advice on the application process. In the end you will spend the exact same amount as going to a big box retailer like Zeller’s except you will get the right product for the job.